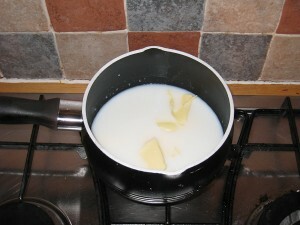 Put the milk, butter and water into a pan and GENTLY warm the mixture on a low heat until the butter has just melted. Do not let this get too hot, otherwise you will kill the yeast. It wants to be about body temperature. Next, you need to make the dough. You can either make the dough by hand or by using a food mixer with a dough hook (you could even you the dough setting of your bread machine if you have one). Personally I use a mixer with a dough hook. Sieve the flour into a bowl or your food mixer bowl and stir in the sugar, salt and yeast. Add the vinegar to the bowl. This is one of the secrets of soft bread rolls, it helps the yeast and you can’t taste it. It is used in a lot of air bun recipes. Pour in most of the warm milk/water/butter mixture and start stirring with a knife. Keep stiring until the mixture comes together into a a dough. It wants to be a fairly wet dough so add the remaining liquid if necessary. Different flours take up different amounts of liquid so you may not need all the liquid. 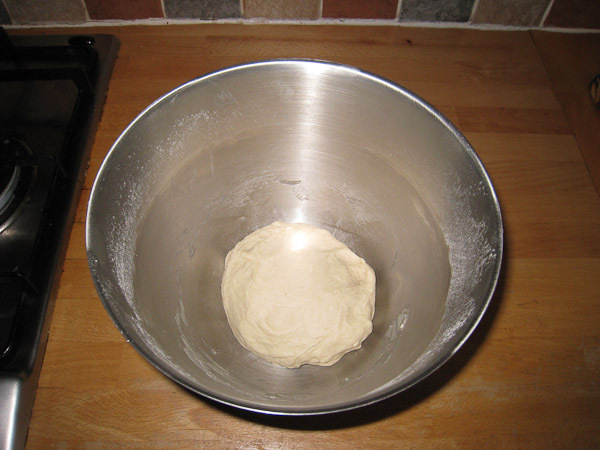 Once everything is combined and you have a nice dough you need to start kneading. If using a mixer, turn it onto a low speed and let it work it’s magic for about 5 to 6 minutes. You will know when it’s done as it will have picked up everything from the sides and will be nice and elastic. If kneading by hand, you will have to knead for about 10 minutes. 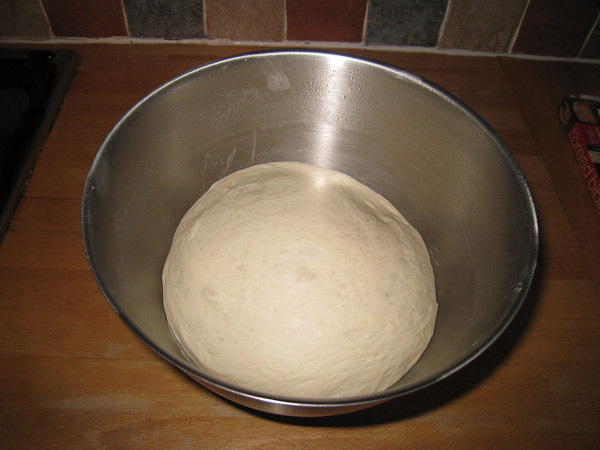 After kneading, shape into a flattish ball, put it into the bottom of a big bowl (at least twice the size of the dough), cover with cling film and put to one side. Leave to prove until it has doubled in size (about an hour). You don’t have to put it somewhere warm, just room temperature will do. Now, split the dough into 6 equal size pieces (I use a set of kitchen scales to make sure they are all the same size) and form each one into a small ball. Place a sheet of baking paper onto a tray and place the 6 balls onto the tray. Squash the balls down with your hand until the are about 2cm heigh. Make sure they are evenly spread out and leave a small gap between each one. lightly oil a piece of cling film and place over the top (to stop them drying out). Put to one side again for about 1 1/2 hours until doubled in size again. If you don’t leave them for long enough they won’t be as light and fluffy. Remove the cling film and place the rolls into the oven. Bake for about 12-14 minutes until they go a nice golden brown on top. You may need to spin the tray round half way through if your oven cooks unevenly. When you remove the rolls from the oven, if you want a super soft crust, cover them with a tea towel until they have cooled. This keeps the crust moist and therefore soft. This entry was posted on Wednesday, November 16th, 2011 at 2:07 pmand is filed under . You can follow any responses to this entry through the RSS 2.0 feed. You can skip to the end and leave a response. Pinging is currently not allowed. Hi Vivien, I’m trying to make more and more of my own bread as it’s so much better than supermarket bought bread so watch out for more posts soon. Thanks for the book recommendation – I’m currently on the lookout for a couple of good bread books so I’ll go and have a look at it. I have tried these twice and got disappointing results each time. The texture was fine and so was the taste but they come out quite flat (only about 2cm thick). 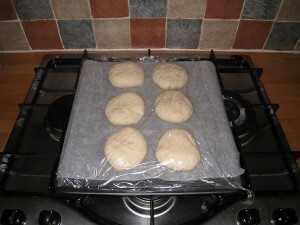 I have mixed the dough in a bread-maker then put the 6 rolls on a tray to rise covered in cling film. I did this in an oven set at just 40deg for 90min or so. 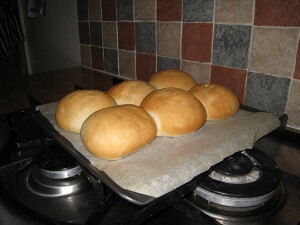 The rolls start to rise then spread out and flatten. I think they double in size and the final texture is quite light. To make the dough I put the warmed water, milk and butter in the bottom and added the mixed flour, yeast, sugar and salt on top. I sprinkled the vinegar on top of the dry ingredients. The bread-maker does the kneading and one proving but not the second. Any idea why they are going flat? Do you think the dough may too moist (it seems OK to handle) or perhaps proving in the oven may be wrong. I have used strong white organic flour and all ingredients as per your recipe. Bob here (the original author). It sounds like you are over proving the dough on the second rise. The bread should rise up and double in size. If they collapse down and spread out, it means that the gas has built up inside too much and burst all the small air pockets (think of it like over inflating a balloon). 40deg is far too hot – just room temperature is fine. If you want to speed up the proving process, you could put them in a gently warmed oven (around 25 – 30deg) but NOT for the full 90 minutes. At a guess, perhaps 40 minutes or so. I just made a triple batch of these and they are excellent.. Going to be filled with pulled pork and BBQ sauce next weekend. Can’t wait. Glad they turned out so well for you. Hope you have some great weather for the BBQ! I have tried these three times since your helpful message. I have achieved better results but I still cannot produce rolls that look as high and light as yours. I tried the last 2 batches by hand rather than using the bread machine to knead. I have also tried different flour. My rolls are still generally quite flat and although the texture is good and by covering with a cloth the crusts are soft, they are not very light but more of a medium density. We do quite like them because they are easy to eat as a ‘sandwich’ but I would like them to be lighter. Of course I don’t expect you to explain the problems of all your followers but if you can think of what else I might try I would like to give it a go. I still think it’s a great recipe regardless and will keep trying. I just have a batch of dough proving, so not sure how they will turn out yet but excited to have found a recipe for soft white rolls at last! However, in response to Derek’s post about the finished rolls turning out flatter than expected, I had similar problems when I first started making bread. The answer is to make sure that you form very tight balls of dough when giving them (rolls or bread) the final shape before the last proving. You can be quite firm with bread dough, so make sure you stretch the rolls or round loaves using cupped hands and tucking in the edges underneath, tightening with the edges of your hands. I learned this on a workshop and haven’t had a flat loaf since. Soft white rolls an unqualified success using your great recipe. thanks, I’ll be making theses on a regular basis! I tried again taking note of your tip to keep the dough balls tight with a definite improvement to the end result. It is a small change but helps a lot. Still not perfect but good enough for me (it is quite a black art really)! Many thanks Pete (and Bob of course). Am planning on baking at the weekend, what vinegar did you use, eg. White, balsamic etc? Hi, I just used ordinary white vinegar but any sort will do (even malt vinegar) as it’s used in such a small amount you can’t taste it. Bob. I’ve never tried using Stork to make bread with to be honest. However, I don’t think it will work very well as I’ve never seen anyone else use it either!. If you don’t have any butter you can always try using a vegetable oil instead. It will cling quite a lot but you should be able to get it off. If it is too sticky then try reducing the liquid in recipe a little bit or add in a tablespon or 2 of extra flour. Being a originally from the north if the UK i do like a bit of bread!! Been making bread on and off at home for years in the oven and with a bread maker… Throughout all this time I have strived to try and find a good Recipe for soft bread rolls… So after coming across your Blog I tried your recipe last night and have to say they are just perfect!!! I only wish i had found your recipe years ago…!!! Hi, You should just be able to double the quantities. However, if you do that you may want to reduce the amount of yeast a little bit (perhaps only use 3/4 of the second sachet). Thanks. Wow only been making bread for a week all by hand no machinery required, just been doing ordinary loafs and they’ve been going down a treat, just decided to try bread rolls for a change and for a complete novice what a success your recipe is. You can use Stork or indeed any of the baking margarines or even the spreadable butter substitutes such as Clover because it is the small amount of fat that adds flavour. But just be sure you don’t use one of the “light” ones which are basically water. I have been trying for years to find a recipe that gives me ” lovely buns “. At last, I’ve found it, they were perfect. 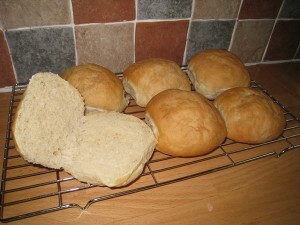 Absolutely the best recipe for bread rolls, I make a dozen at a time and freeze them. For the second proving on the baking trays I put them in a large polythene bag which gives them ample room to rise, I found cling film sticks to the dough. I tried, first time came out perfect. Great recipe, appreciated you shared this. I suspect malt vinegar’s what most people will have in the cupboard – it works fine. I always warm the water, melt the butter in that and then use the milk to cool it down again. I’ve just made a batch of these…absolutely yummy, they won’t last long. They’re so soft. I used my Kenwood dough hook to mix, it was very sticky but instead of flour I oil my hands and work top and it enables me to work with a wet dough.